Participating in international competitions is probably the best part of debating. For those who don’t believe that yet, here’s how one of our newest members (Barbara Neuwirth) experienced her first time debating abroad. To put it in Mr. Trump’s words: It was just so great! 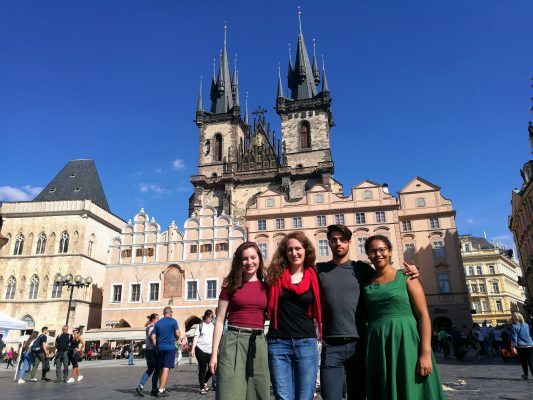 Just before uni started again, DK Wien sent a delegation of four debaters (Joy Edobor, Tommi Deimel, Katrin Fallmann and myself) to the lovely city of Prague, well known capital of beer, as well as of the Czech Republic itself. Having started debating only a few months prior to that, I must admit I was quite excited (better: super nervous) to take part in my first international debating competition. Would I get kicked out because my English was too bad? Would I vomit over the Judges? Would Katrin deeply regret pro-aming me due to a, then expected, major tearful breakdown? Luckily, neither of those things happened. We faced only one slightly embarrassing incident on the train ride, when Katrin and I came to the painful realisation that our chosen team name “Czech us some beer” (German speakers will know) doesn’t make any sense whatsoever to an English native. We’ll try better next time. Arriving at the location the following day, the National Scout Hall, what we found was a majestic old building right next to the famous astrological clock in the middle of Prague’s historical town centre. Debating with a view of one of Europe’s prettiest town squares created the feeling of delivering a speech of considerable importance, which might have helped me to calm down a bit. Looking back, that was me entering what I’ll call “politician mode”. Both our teams did amazingly well in the first two rounds, where we all finished 2nd debating about political satire and state-run brothels – topics that I was pleasantly surprised with! Being a bit tired during the 3rd round, we had a harder time with a cheeky little Trump motion. Admittedly, I should’ve expected this in 2018. Already looking forward to a well-deserved dinner and drink after the last round, a big surprise was waiting for us in the announcement hall: Katrin and I had broken and Tommi and Joy had, while narrowly missing the break, also done an incredible job in the last round! Of course, being responsible adults, this didn’t come without a minor inconvenience: Celebrations hat to be cut a bit short that night to be able to get some rest before the next round on Sunday. When the semi-final motion “TH, as the EU, would go ahead and boycott US sanctions imposed on Iran” was announced on the following morning, I realised two things. First, we probably wouldn’t make it to the finals. Secondly, the first thing I’d do right after getting home would be to dive head first into some good reading material on Iran-US relations. (It was not the first thing I did, and recommendations are still appreciated.) It was still a great pleasure to be able to listen to the other great speeches, foremost my own partner’s, the club’s designated expert on IR. 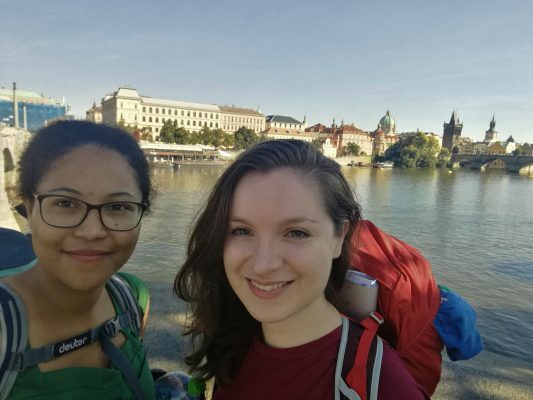 Finally, Joy and I made good use of the stunning late summer weather in Prague when we successfully climbed up the hill to explore Prague’s gorgeous castle before taking the train back home to Vienna. Thanks Joy and Tommi for a great weekend and especially Katrin for taking me with her. I’m really looking forward to all the debates to come! R1. THR the rise of satire as a means of political criticism. R2. THW introduce state-run brothels. R3. THBT it is the morally correct path for those who oppose Trump to depart the administration rather than trying to block it from within. R4. THW subsidise banks to disproportionally direct loans to poor communities and individuals. Semi: TH, as the EU, would go ahead and boycott US sanctions imposed on Iran. Final: THBT atheists should try to convince religious people that there is no god. 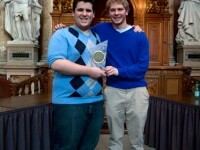 Colgate wins Vienna IV 2011!